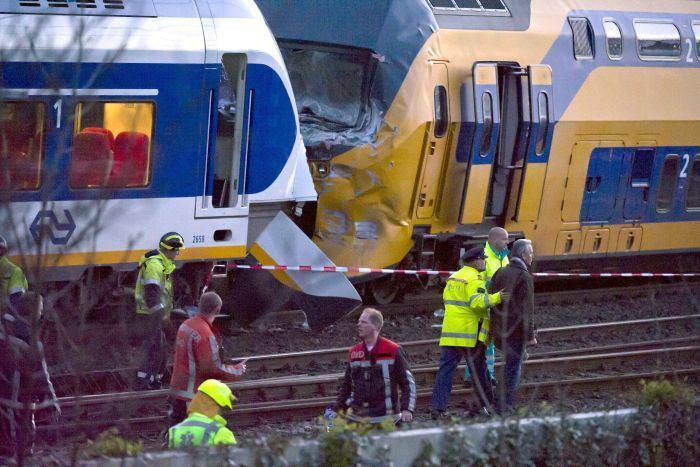 AMSTERDAM – Two busy passenger trains collided head-on near an Amsterdam park Saturday, injuring scores of people including more than 80 seriously, a police spokesman said. National Police Corps spokesman Ed Kraszewski told Amsterdam local news network AT5 that some 70 people had minor injuries and 81 were “seriously or very seriously injured.” He said the victims sustained broken bones and neck injuries. Fleets of ambulances ferried injured away from the scene. AT5 posted photos on its website showing two trains that appeared to have collided head-on. Both trains were still on the rails and the double-decker intercity train sustained damage near some doors close to the impact. It was not immediately clear how the two trains could wind up traveling toward one another on the same track. Kraszewski said the cause of the crash would be investigated. The crash caused chaotic train traffic around western Amsterdam and halted all trains between the city’s Central Station and Schiphol Airport. Bboth convoys were circulating at an estimated speed of 50 kilometers per hour, while the other driver failed to make statements to the police because it is serious. The rail traffic between Amsterdam and Zaandam cities, Haarlem and Schiphol Airport is suspended, although it is possible to access the airport through another station near Amsterdam, Duivendrecht. The transport minister, Melanie Schultz, said he expects the earliest possible causes of the accident, which occurred on Saturday between Amsterdam Central Station and Sloterdijk, a suburb of the city.